Van Helsing is a 2004 American period action horror film written and directed by Stephen Sommers. It stars Hugh Jackman as vigilante monster hunter Van Helsing, and Kate Beckinsale as Anna Valerious. The film is an homage and tribute to the Universal Horror Monster films from the 1930s and '40s (also produced by Universal Studios which were in turn based on novels by Bram Stoker and Mary Shelley), of which Sommers is a fan. The eponymous character was inspired by the Dutch vampire hunter Abraham Van Helsing from Irish author Bram Stoker's novel Dracula. 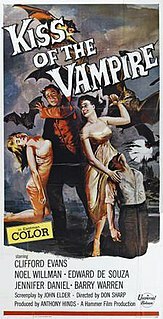 Distributed by Universal Pictures, the film includes a number of monsters such as Count Dracula, Frankenstein's monster, Mr. Hyde and werewolves in a way similar to the multi-monster movies that Universal produced in the 1940s, such as Frankenstein Meets the Wolf Man, House of Frankenstein and House of Dracula. Despite mostly negative reviews, the film grossed over $300 million worldwide. In 1887 Transylvania, Doctor Victor Frankenstein creates a monster with the aid of Count Dracula, who reveals that he intends to use the creature for his own evil plans. Dracula kills the doctor as a mob of villagers storms the castle. His assistant Igor escapes, but the villagers chase the monster to an old windmill and set it ablaze. The villagers are scared off by Dracula and his brides, who witness the monster and the doctor's research apparently destroyed by the fire. One year later, after killing the elusive Mr. Hyde at the Notre-Dame Cathedral in Paris, monster hunter Van Helsing returns to the Vatican in Rome. He learns that his mission to destroy Dracula and his amnesia are penance for unremembered sins that cause nightmares. He is tasked with helping the last of an ancient Romanian bloodline, Velkan and Anna Valerious, who must kill Dracula so that their ancestors may enter Heaven. Carl, a friar, provides Van Helsing with aid and weapons. In Transylvania, Velkan is apparently killed during an attempt to trap and kill a werewolf, and Anna is attacked by Dracula's brides shortly after Van Helsing's arrival. He saves Anna and kills Marishka, one of the brides, but as the last of her line, Anna becomes more determined to kill Dracula. In order to protect her, Van Helsing knocks her out to prevent her from leaving. She awakens that night and encounters Velkan, who reveals Dracula has a dark secret, but to her horror, he becomes a werewolf, having been bitten by the original one earlier, and attacks. After she and Van Helsing track him to Frankenstein's castle, they discover that the vampires are attempting to give life to their born-dead children, using Velkan as the source of the power. Van Helsing, dubbed "Gabriel" by Dracula, realizes they had ties in the past. Van Helsing refuses Dracula's offer to return his memory and escapes. The experiment fails, and the vampire children die, but Velkan turns on Anna as he is consumed by his curse. Van Helsing and Anna escape together. Under the remains of the old windmill, Van Helsing and Anna encounter Frankenstein's monster. Because he is not evil, Van Helsing cannot allow him to be killed, even though he claims to be key to Dracula's experiment. The werewolf witnesses the conversation and escapes to inform Dracula. Meanwhile, Carl discovers a painting that comes to life, depicting a werewolf and a vampire battling. The group travels by carriage to Budapest, luring the remaining brides into a trap and killing Verona. The werewolf ambushes the real carriage and bites Van Helsing before being killed. Anna is captured and held as a bargaining chip in exchange for Frankenstein's monster. They hide him in a crypt, but he is taken by the count's undead underlings while Van Helsing and Carl rescue Anna. Returning to the Valerious' castle, Carl discovers an inscription and creates a doorway to the castle. After failing to free Frankenstein's monster from his imprisonment, he lets them know of a cure to lycanthropy that Dracula possesses. Carl determines that the bite of the werewolf is the only way to kill Dracula. He and Anna take Igor to find the cure while Van Helsing goes to free Frankenstein's monster. Igor escapes while the final bride, Aleera, beats Anna. Carl tries delivering the cure to Van Helsing. Igor confronts Carl on a bridge, but the confrontation sends Igor falling to his demise. Frankenstein's monster saves Anna and urges her to help Carl and Van Helsing. She kills Aleera and arrives at the castle. As the werewolf, Van Helsing battles Dracula and, despite the vampire's attempts to reason with him, manages to bite him, causing him to dissolve into a skeleton. Anna bursts in, causing her to be attacked and accidentally killed by Van Helsing, but not before she delivers the cure. After narrowly stopping Carl from killing him, Van Helsing returns to normal, stricken with grief over what he has done. At a funeral pyre, Van Helsing witnesses the spirits of Anna and her family ascending into the afterlife while Frankenstein's monster rows away on a raft out to sea. Van Helsing and Carl ride off into the sunset. Hugh Jackman as Gabriel Van Helsing, a legendary hunter of monsters. Kate Beckinsale as Anna Valerious, the last descendant of an ancient Romanian family. Richard Roxburgh as Count Vladislaus Dracula, the ruler of Transylvania. David Wenham as Carl, a friar of the Holy Order. Silvia Colloca as Verona, the oldest of Dracula's brides. Josie Maran as Marishka, the third of Dracula's brides. The film's original soundtrack was composed by Alan Silvestri. Vivendi Universal Games published a Van Helsing video game for PlayStation 2, Xbox, PC and Game Boy Advance. The game follows a similar plot to the movie, has gameplay similar to Devil May Cry and the PS2 and Xbox versions feature the voice talent of many of the actors including Hugh Jackman. Van Helsing also features in a slot game produced by International Game Technology. The game is available in real world casinos and online, though users in Argentina, Australia, Canada, China, France, Germany, Israel, Italy, Netherlands, Nigeria, Norway, Russia, South Africa, Thailand, Turkey and the US are excluded from playing the online games. The film opened at #1 in the weekend of May 7–9, 2004. The film grossed US$300,257,475 worldwide of which US$120,177,084 was from the US. Van Helsing received mostly negative reviews by critics. Rotten Tomatoes, a review aggregator, reports that 24% of 224 surveyed critics gave the film a positive review; the average rating is 4.2/10. The site's consensus calls the film a "hollow creature feature that suffers from CGI overload." Metacritic rated it 35/100 based on 38 reviews. Audiences polled by CinemaScore gave the film an average grade of "B" on an A+ to F scale. James Berardinelli of ReelViews gave an extremely negative review, rating the film half a star out of four and calling it "the worst would-be summer blockbuster since Battlefield Earth". Furthermore, he wrote "There are quite a few unintentionally funny moments, although the overall experience was too intensely painful for me to be able to advocate it as being "so bad, it's good." ... Some, however, will doubtless view it as such. More power to them, since sitting through this movie requires something more than a strong constitution and a capacity for self-torture." Mick LaSalle of the San Francisco Chronicle greatly disliked the film, writing: "Writer-director Stephen Sommers (...) throws together plot strains from various horror movies and stories and tries to muscle things along with flash and dazzle. But his film just lies there, weighted down by a complete lack of wit, artfulness and internal logic. ... What Sommers tries to do here is use action as the only means of involving an audience. So story is sacrificed. Character development is nonexistent, and there are no attempts to incite emotion. Instead, Sommers tries to hold an audience for two hours with nothing up his sleeve but colored ribbons, bright sparklers and a kazoo. What he proves is that this is no way to make movies." Roger Ebert of the Chicago Sun Times gave the film 3 stars out of 4 stating that "At the outset, we may fear Sommers is simply going for f/x overkill, but by the end, he has somehow succeeded in assembling all his monsters and plot threads into a high-voltage climax. Van Helsing is silly, spectacular and fun." The animated prequel titled Van Helsing: The London Assignment takes place before the main events of the film, focusing on Van Helsing's mission to try to stop Dr. Jekyll and Mr. Hyde from terrorizing London. There is also a one-shot comic book, published by Dark Horse Comics, titled Van Helsing: From Beneath the Rue Morgue, that follows Van Helsing on a self-contained adventure that occurs during the events of the film, just after the death of Jekyll/Hyde in Paris but before Van Helsing returned to Rome. In the adventure, Van Helsing deals with Doctor Moreau and his hybrid mutants. In May 2012, Universal Pictures announced that they would be rebooting the film with Alex Kurtzman and Roberto Orci as a two-year deal to produce a modern reimagining and Tom Cruise to star as the title character and also produce the film. Rupert Sanders is in talks to direct the film. Orci spoken to IGN that he has hinted that both The Mummy and Van Helsing reboots will have a shared universe. On November 11, 2015, Variety reports that Jon Spaihts and Eric Heisserer will write the reboot, but Cruise left the film. However, in 2016, Cruise signed back on to star in Kurtzman's The Mummy, which was released in theaters on June 9, 2017. ^ a b "Van Helsing". www.filmcommission.cz (in Czech). Retrieved 13 July 2017. ^ "Van Helsing (2004)". British Film Institute. Retrieved 2016-08-07. ^ a b c d "Van Helsing". Box Office Mojo. Retrieved 2014-10-12. ^ "IGT Slots Blocked Territories". Archived from the original on 2014-05-12. Retrieved 2014-05-12. ^ Wloszczyna, Susan (2004-05-10). "Marketing goes to heroic measures". USA Today. Retrieved 2014-10-15. ^ "Van Helsing". Rotten Tomatoes. Retrieved March 8, 2019. ^ "Van Helsing". Metacritic. Retrieved 2014-10-15. ^ Berardinelli, James. "Van Helsing". ReelViews. Retrieved 2012-05-09. ^ LaSalle, Mick (May 7, 2004). "'Van Helsing' a monstrosity of a movie". San Francisco Chronicle. Retrieved 2012-05-09. ^ Ebert, Roger (May 7, 2004). "Van Helsing". Chicago Sun-Times. Retrieved 2012-05-09. ^ "NOMINATIONS FOR 31ST ANNUAL SATURN AWARDS ANNOUNCED". Film Threat. Retrieved 2018-01-22. ^ ""Spider-man 2" Big Winner at the 31st Annual Saturn Awards". Saturn Awards. Archived from the original on 2005-07-25. Retrieved 2018-01-22. ^ McNary, Dave (2005-01-10). "Spidey pic catches 6 f/x noms from VES". Variety. Retrieved 2018-01-22. ^ Kroll, Justin (2012-05-02). "Orci, Kurtzman sign two-year Universal deal". Variety. Retrieved 2012-05-02. ^ "Universal Signs Kurtzman and Orci; Pair Takes On 'The Mummy' and 'Van Helsing'". deadline.com. 1 May 2012. Retrieved 8 October 2018. ^ "BREAKING: Rupert Sanders Circling Universal's Tom Cruise-Starring VAN HELSING". Twich. 2012-10-10. Archived from the original on 2013-01-18. Retrieved 2013-01-23. ^ Tilly, Chris (18 October 2013). "Bob Orci Discusses Van Helsing Reboot". IGN. Retrieved April 28, 2018. ^ Kit, Borys (January 6, 2014). "Forget Franchises: Why 2014 Will Be Hollywood's Year of the 'Shared Universe'". The Hollywood Reporter. Retrieved April 28, 2018. ^ Kroll, Justin (November 14, 2015). "Universal's 'Van Helsing' Reboot Enlists Scribes Jon Spaihts and Eric Heisserer (EXCLUSIVE)". Variety. ^ Kroll, Justin (November 11, 2015). "Universal's 'Van Helsing' Reboot Enlists Scribes Jon Spaihts and Eric Heisserer (EXCLUSIVE)". Variety. Retrieved April 28, 2018. Professor Abraham Van Helsing is a fictional character from the 1897 gothic horror novel Dracula. Van Helsing is an aged polymath Dutch doctor with a wide range of interests and accomplishments, partly attested by the string of letters that follows his name: "MD, D.Ph., D.Litt., etc. ", indicating a wealth of experience, education and expertise. The character is best known throughout many adaptations of the story as a vampire hunter and the archenemy of Count Dracula. The Wolf Man is a 1941 American horror film written by Curt Siodmak and produced and directed by George Waggner. The film features Lon Chaney Jr. in the title role, and also features Claude Rains, Warren William, Ralph Bellamy, Patric Knowles, and Bela Lugosi; with Evelyn Ankers, and Maria Ouspenskaya in supporting roles. The title character has had a great deal of influence on Hollywood's depictions of the legend of the werewolf. The film is the second Universal Pictures werewolf film, preceded six years earlier by the less commercially successful Werewolf of London (1935). Dracula is a 1931 American pre-Code vampire-horror film directed by Tod Browning and starring Bela Lugosi as Count Dracula. Produced by Universal, the screenplay is based on the 1924 stage play Dracula by Hamilton Deane and John L. Balderston, which in turn is loosely based on the novel Dracula by Bram Stoker. The Monster Squad is a 1987 American horror comedy film directed by Fred Dekker and written by Shane Black and Dekker. Peter Hyams was one of the executive producers. It was released by TriStar Pictures on August 14, 1987. The film features the Universal Monsters, led by Count Dracula. They, in turn, combat a group of savvy kids out to keep them from controlling the world. The Kiss of the Vampire is a 1963 British vampire film made by the film studio Hammer Film Productions. The film was directed by Don Sharp and was written by producer Anthony Hinds, credited under his writing pseudonym John Elder. The Brides of Dracula is a 1960 British horror film made by Hammer Film Productions. Directed by Terence Fisher, the film stars Peter Cushing, David Peel, Freda Jackson, Yvonne Monlaur, Andrée Melly, and Martita Hunt. Monster Force is a 13-episode animated television series created in 1994 by Universal Cartoon Studios and Canadian studio Lacewood Productions. The story is set in approximately 2020 and centers on a group of teenagers who, with help of high tech weaponry, fight off against classic Universal Monsters and spiritual beings threatening humanity. Some of the crew have personal vendettas, while others fight for Mankind out of a sense of altruism. The series aired in syndication alongside another Universal animated series, Exosquad. Universal Studios Home Entertainment released the first seven episodes to DVD on September 15, 2009. Lucy Westenra is a fictional character in the novel Dracula (1897) by Bram Stoker. She is introduced as Mina Murray's best friend, the 19-year-old daughter of a wealthy family. Her father is mentioned in the novel when Mina says he was a sleepwalker, and her elderly mother is simply stated as being Mrs. Westenra. In the 1931 Universal production, she is called Lucy Weston. In the 1958 film Dracula, she is called Lucy Holmwood, Arthur Holmwood's sister, who is engaged to Jonathan Harker. Universal Classic Monsters is a phrase used to describe the horror, fantasy, suspense and science fiction films made by Universal Pictures during the decades of the 1920s through the 1950s. They began with The Hunchback of Notre Dame and The Phantom of the Opera, both silent films starring Lon Chaney. Universal continued with talkies including monster franchises Dracula, Frankenstein, The Mummy, The Invisible Man, The Wolf Man and Creature from the Black Lagoon. The films often featured Bela Lugosi, Boris Karloff and Lon Chaney Jr.
Mary Shelley's 1818 novel Frankenstein; or, The Modern Prometheus, and the famous character of Frankenstein's monster, have influenced popular culture for at least a century. The work has inspired numerous films, television programs, video games and derivative works. The character of the monster remains one of the most recognized icons in horror fiction. The character of Count Dracula from the 1897 novel Dracula by Bram Stoker, has remained popular over the years, and many films have used the Count as a villain, while others have named him in their titles, such as Dracula's Daughter, The Brides of Dracula, and Dracula's Dog. Dracula has enjoyed enormous popularity since its publication and has spawned an extraordinary vampire subculture in the second half of the 20th century. More than 200 films have been made that feature Count Dracula, a number second only to Sherlock Holmes. At the center of this subculture is the legend of Transylvania, which has become almost synonymous with vampires.